Five distinct products in multiple variations are built at the AGCO Jackson, Minnesota plant, including the Challenger, Massey Ferguson high-horsepower tractors, Challenger track and articulated tractors and RoGator and TerraGator row crop applicators. 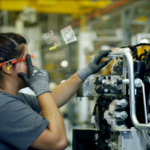 AGCO has adopted lean manufacturing initiatives to streamline processes, provide flexibility and empower employees to make suggestions that can help the company reach its goal of being No. 1 in customer-perceived quality. How does the manufacturing team at AGCO Jackson operations build complex row crop tractors and applicators to the high level of quality customers expect, when no two are exactly alike? When there may not even be two similar machines on the line at one time? Managers at the Jackson site will tell you one big reason is a culture that empowers employees. From the individual floor operators to the department managers, every employee is empowered to make suggestions that increase efficiency and improve product quality and safety. In 2013, AGCO Jackson began using Kaizen Action Sheets (KAS) a three-step, problem-solving online tool employees could use to offer their suggestions for ways to improve safety, product quality or reduce costs in their work areas. Delivering high-quality products is a major goal for AGCO, and employees are taking the initiative to ensure AGCO delivers on that promise. Since the inception of KAS, 21,739 ideals have been submitted. The recordable savings from employee ideas that were implemented in 2016 and 2017 have reach $1.5 million. 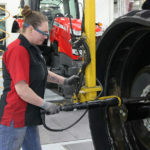 Suggestions from employees have brought about both minor changes and large adjustments in the manufacturing processes at AGCO. Employee suggestions can be simple or complex and broad in scope. For example, an employee-driven redesign of the spray nozzle flow validation test allowed AGCO to test the liquid system with the spray booms folded in as well as to capture all the liquid put through each individual nozzle. This was a complex suggestion but it resulted in a significant step forward in our production process, says Fisher. When a drip formed on a spray nozzle during the assembly process, an observant employee took notice, checked out sprayer units at the plant and fired questions to other employees who knew about spray nozzles. The result – a seal with a more effective design was incorporated into the nozzles. In the weld department, an employee suggested a simple modification to a weld fixture, so parts can only fit into the jig the correct way. “It was a simple, yet effective modification that ensures mistakes aren’t made in this area when a tractor is being built,” notes Fisher. A welder responsible for welding “legs” for the RoGator® C Series self-propelled row crop applicators couldn’t see a problem, but he felt one on the surface of a machined kingpin he installed regularly. When he asked support teams to double check the kingpin, they discovered the supplier had switched machines processing this piece. That change meant the surface finish didn’t meet AGCO’s requirement and the acceptable tolerance level. Continuing to use the substandard part could have led to a shortened life of the joint. The employee headed off what could have been downtime for the customer and dealer. “These are just a few examples of positive outcomes that happen when employees are engaged, understand AGCO’s business and make a conscious effort to ensure equipment leaving the plant is of the highest quality possible,” says Fisher. “We wouldn’t have achieved our goals if it weren’t for employee insights and suggestions on everything from quality control steps to time-saving measures that improve our overall processes,” says Fisher. Measurable product quality improvements at the Jackson plant are impressive. Changes implemented from 2014 through 2017 have reduced early-hour repair frequency by more than 55 percent. A higher quality, more reliable product in the hands of customers and dealers improves their experience and product satisfaction. Lean manufacturing practices are another innovation implemented in Jackson since 2011 when the plant adopted a mixed model manufacturing line to streamline processes and provide the flexibility to custom manufacture machines where no two are exactly alike. Today, five distinct products in multiple variations are built at the Jackson plant, including the Challenger® and Massey Ferguson® high-horsepower tractors, Challenger track and articulated tractors and RoGator and TerraGator® row crop applicators. One lean manufacturing initiative used very effectively in Jackson is a lean daily management system that ensures critical information is communicated in timely, systematic forums. Each morning, the Jackson management team meets on the plant floor to review cost, delivery, quality and safety targets, or more importantly, any risk to meet them. The management team meeting takes place after a standardized flow of shop floor startup meetings and department meetings. All meetings are driven by standardized control points and metrics posted on boards and kiosks on the plant floor. 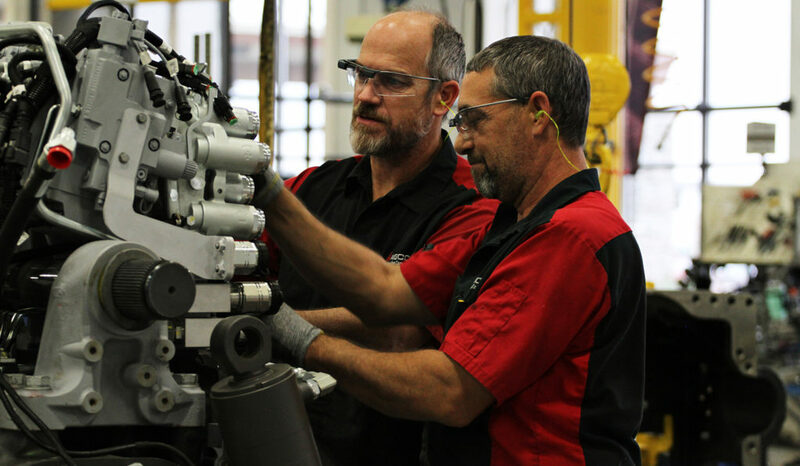 The manufacturing innovations implemented at AGCO Jackson operations and the results have not gone unnoticed throughout the manufacturing industry. In fact, AGCO Jackson operations is the only agricultural manufacturer to receive the Association for Manufacturing Excellence (AME) Excellence Award and to be named the ASSEMBLY Plant of the Year. The AME award involves completing an extensive achievement report to demonstrate continuous improvement, best practices, creativity and innovation in manufacturing. Facilities then are evaluated during a site visit that validates the achievement report. The 2017 Assembly Plant of the Year Award from ASSEMBLY magazine. The award is presented to a state-of-the-art facility in the United States that has applied world-class processes to reduce production costs, increase productivity, shorten time to market or improve product quality. To top off its 2017 recognitions, in early March, Jackson also was named a recipient of IndustryWeek’s Best Plants of the Year award.